Why do people often swarm to a museum exhibition but ignore the permanent collection? Is it the fact that the permanent collection “will always be there” and the special exhibition has a limited engagement or is it a smart title such as “Behind the Red Velvet Curtain” which engages the imagination? One way that museums have faced this challenge is by doing exhibitions around the permanent collection. The term Blockbuster was coined when Thomas P.F. Hoving was director of the Metropolitan Museum. One of his first blockbusters took place in 1970. Called “Masterpieces of Fifty Centuries” it was drawn exclusively from the Metropolitan’s collections. Today, with finances tight the in-house exhibition has fiscal advantages as well. Some museums have put an additional twist on this formula by creating long term exhibitions that are intended to show works from the permanent collection but need not remain static. The New Mexico Museum of Art did this with a show called, “How the West is One” which opened in April 2007. Read that title again so you are sure you got it. Not only an evocative title but one that has something to say. The curator of the show is Joseph Traugott, curator of 20th century art at the museum. He believes that the importance of New Mexico in the development of American art has been missed by many. So here he shows the development of the styles from the late 19th century to the present. 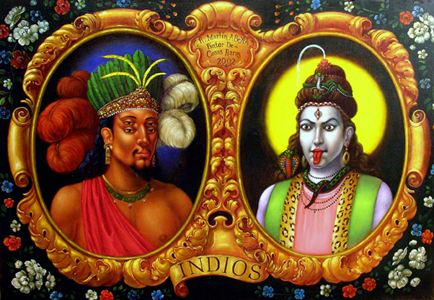 This joining of the complexities of the various cultures of New Mexico is exemplified in the very first painting in the exhibition by Ray Martin Abeyta (1956-), ‘Indios’, showing an American Indian and an Eastern Indian, but separated and not in the same frame. One of my favorite pictures in the show is by James Stovall Morris (1902-73). It represents a Hispanic funeral in New Mexico and certainly demonstrates the mores of a culture. It was commissioned by the U.S. General Services Administration (GSA) during the depression as part of the WPA program through which so much great art was sponsored by the government. The resulting works belong to the Federal Government and are placed in museums as long term loans. Our son Hunter, the Hopi kachina doll collector, used to lament that there was no joy in seeing examples in museum collections because he could not hope to own them, or even similar pieces. They might be out of his price range or just not available. “How the West is One” offers more hope to collectors as it extends to the present with pieces by artists active today. Here, I cannot pick a favorite but I love the sneakers by a fabulous Native American Beader by the name of Terri Greeves (1970-). 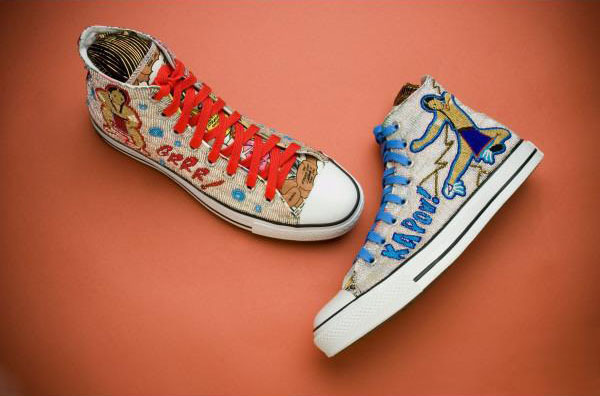 While one might not be able to afford a pair of her beaded sneakers her bracelets start at around $200. Over the past four years Traugott has added or switched out works of art in order to include new acquisitions that are pertinent to the exhibition. As a result you are getting a dynamic and interesting exhibition which speaks to the tourist as well as the resident allowing them to enjoy the show and then revisit it without getting bored. Should you be in Santa Fe between now and next March, when the exhibition is scheduled to end, I recommend that you see it for yourself.